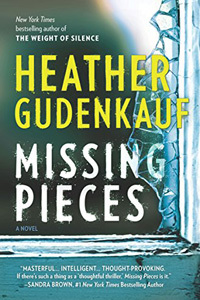 Missing Pieces by Heather Gudenkauf: Synopsis and Online Purchase Options. Synopsis (from the publisher): Sarah Quinlan's husband, Jack, has been haunted for decades by the untimely death of his mother when he was just a teenager, her body found in the cellar of their family farm, the circumstances a mystery. The case rocked the small farm town of Penny Gate, Iowa, where Jack was raised, and for years Jack avoided returning home. But when his beloved aunt Julia is in an accident, hospitalized in a coma, Jack and Sarah are forced to confront the past that they have long evaded. Upon arriving in Penny Gate, Sarah and Jack are welcomed by the family Jack left behind all those years ago — barely a trace of the wounds that had once devastated them all. But as facts about Julia's accident begin to surface, Sarah realizes that nothing about the Quinlans is what it seems. Caught in a flurry of unanswered questions, Sarah dives deep into the puzzling rabbit hole of Jack's past. But the farther in she climbs, the harder it is for her to get out. And soon she is faced with a deadly truth she may not be prepared for.